Marianne McKenna | TV, eh? This week’s episode of Canada: The Story of Us features some remarkable technological advances that were critical in joining Canada from sea to sea to sea: the Welland Canal, the Victoria Bridge and the first underwater telegraph cable. However, with a time span of 65 years, once again many things were left out. And I know, with a history as diverse and a show seeking to cover as much as possible in 44 minutes, I get it, things will be left out. But this week, David Plain and I were both overcome by the elephant in the room. I should point out that David and I each watch the episodes and then share our thoughts, either talking about the show or simply writing down quick blurbs and sharing that; we do not collaborate so as to ensure we present our own opinions about each episode. As I watched Sunday’s episode “Connected,” I was trying to see the big picture, where this portion of the story fits amid what we have already seen. Historically, at this juncture the territory that will become Canada had been ruled by Generals; jurisprudence has more or less fallen to the military, including the First Nations people who were considered military allies and instrumental in the defeat of the Americans. Following the War of 1812, control shifts from the military to civilian, and the utility of Indigenous people fades from importance. That disappearance is also reflected in Canada: The Story of Us. Up until now, First Nations people have been present and a part of the story that CBC is telling, primarily one of mere survival of the elements and war. The role the first people played was vital to Canada before Canada even became Canada. Now that war is no longer an ongoing threat, ideologies change, warriors who are familiar with the topography are no longer a commodity required by the generals of the military and now the thrust becomes uniting Canada. But to what purpose, and at what expense? 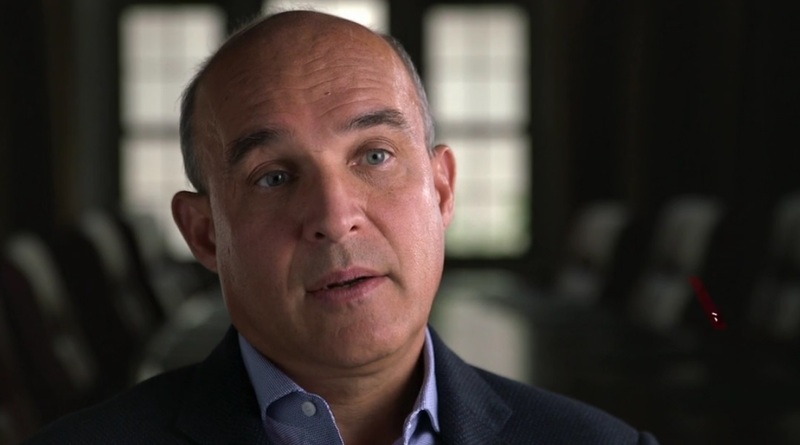 Very early on we hear from Jim Balsillie, Chairman of Council of Canadian Innovators, “Canada was a vast open land and we needed transportation infrastructure to be able to harness the untapped potential of this country,” he says. But who and what would be the most significant objector to the commodification of the land and its resources? First Nations. How best to deal with this issue? Make them disappear. Canada: The Story of Us, made them disappear too. A quick history lesson omitted by the show reveals that, in 1928, the Darling Report set the foundation for the process of colonization, outlining the Indian “civilization” program, that would include settling First Nations in communities where they could be educated, Christianized and made over into farmers. Then, later in 1844, the Bagot Commission recommended the assimilation of First Nations people by means of both residential schools and centralization of policy. In essence, these studies set the groundwork for The Indian Lands Act of 1960, and the Indian Act of 1876. As I watched the segment on the Victoria Bridge, I wondered, “Where are the ironworkers from Kahnawa:ke?” Last fall, I covered Mohawk Ironworkers on APTN, so I have some familiarity with that portion of Indigenous history in Canada. A quick bit of research revealed that yes, the ironworkers from Kahnawa:ke were not only instrumental in the building of this bridge and many others, they were also hard at work in the building of the Canadian Pacific Railway. But the CBC chose not to give them any credit. Just like the policy of the era, the CBC—at least in this episode—appears to be whitewashing history; perpetuating the idea that First Nations people are either just “gone” or did not contribute to the building of our country. Yes the moments covered this week were vital to the story of what Canada is today, and yes it is important that we see how these innovations came to be, and no we cannot change history. However, in this era of reconciliation, I feel, particularly as a non-Indigenous person, that we as Canadians need to learn what we have missed, including the contributions of First Nations people throughout Canada’s history. 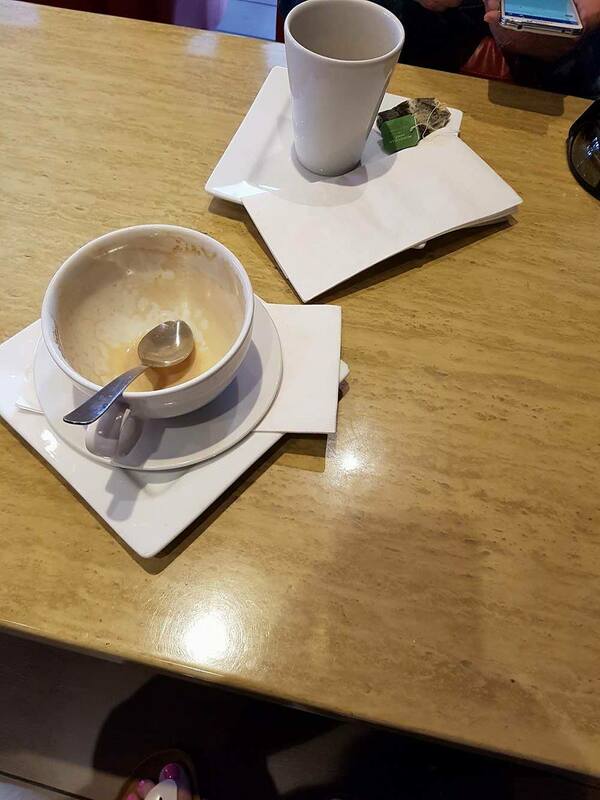 The remnants of my latte and David’s mint tea! This episode was particularly hard to watch. So it’s very difficult to push past the old adage my mother instilled in me as a boy, ‘If you don’t have anything nice to say, then don’t say anything at all.’ But, I’ll try. The theme of this episode is found in the title, “Connected.” But the producers seem to have forgotten to connect with the partners in this enterprise called Canada. As I watched the first 10 minutes—the building of the Welland Canal—I found myself wondering if others watching questioned where and how did they [builders] get this all this land to do all these great things in. The date is 1828, a year after we [Aanishnabeg] ceded the Huron Tract to Upper Canada. For a quarter century before that, we had ceded huge tracts of land for what would become Southern Ontario, our contribution towards the building of Canada. But not a mention of it. Do the producers subscribe to the debunked doctrine of ‘terra nullius’? Now I know that this is supposed to be a celebratory production in honour of Canada’s 150th sesquicentennial, but I really would have liked to see some balance. Some great accomplishments have been achieved in the last 150 years, but some not so great things were done as well, like the Indian Act of 1876 and residential schools. Of course, I don’t really expect pronounced negativity to show up, but a little realism would have been nice though. And did the commentary have to be so syrupy? It made me feel ill. You could easily convince me it was produced in the United States. Anyway, the Indians finally show up for seven seconds at the very end, as the settlers are trying to build their railroad to the West Coast, troublemakers standing in the way of progress. If this keeps up, I am going to have to change the channel. Chi miigwetch to David Plain for sharing his thoughts! Canada: The Story of Us airs Sundays at 9 p.m. on CBC. David Plain B.R.S., M.T.S., is the author of five books with a sixth, The Exmouth Chronicles: A Memoir due out later this month April 2017 by Trafford Publications. You can reach David on Facebook or Twitter.